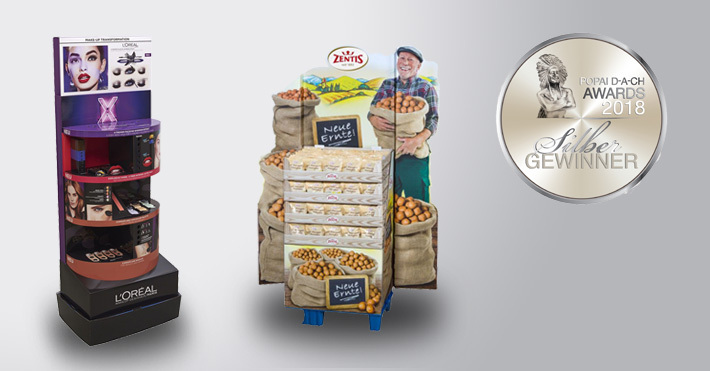 both the Zentis ‘Neue Ernte‘ display for the classic marzipan balls, and the X Fiber Display for L’Oréal for the introduction of various make-up products received the coveted silver trophy. The creative design of this second-placed offering, with embossed wings and the association with real potatoes with the theme “Neue Ernte” surprises customers in a clever and congenial way, and delivers an emotional response, leading to impulse buys. The sophisticated product holder on the embossed rear panel allows the fitted ¼ Chep Display to be transported safely and securely without the need for cushioning or protrusions. The campaign was very noticeable, as it was placed in unusual places for confectionary – in the fruit and vegetables section, for example – and was so successful that it will be (was) repeated in the spring and autumn of 2018. There were also points for the high quality placement for the design introducing new make-up products from L’Oréal Paris. The ¼ Chep premium display with an unusual look that, with its rounded shelves, integrated platforms and testers and embossed blinds, manages to convince through a decorative product display that reflects the brand’s top standards. POPAI D-A-CH e.V. is a non-profit organization, that is recognized as a “centre of excellence and a communication platform in marketing and retail”. Alongside criteria like aesthetics and creativity, an independent jury also looks at compliance to trading standards and the effect on buying behaviour. This year we received nearly 60 entries in 15 categories, and the 25-person jury, experts in marketing, branding, trading, design and teaching determined the winner during the exhibition in February at the EuroCIS trade fair in Düsseldorf.